Today is Mother’s Day in the UK and I’ve had the idea for a Lemon and Blueberry cake since it featured on the cover of the Mother’s Day issue of Good Food magazine. I loved the idea of thick icing dripping on the cake and the tiny cute edible flowers. However when I decided to make them, I wanted to eat them for breakfast and I wanted them ready within half an hour. So no hope for a whole loaf in that time scale, so I made them into muffins. 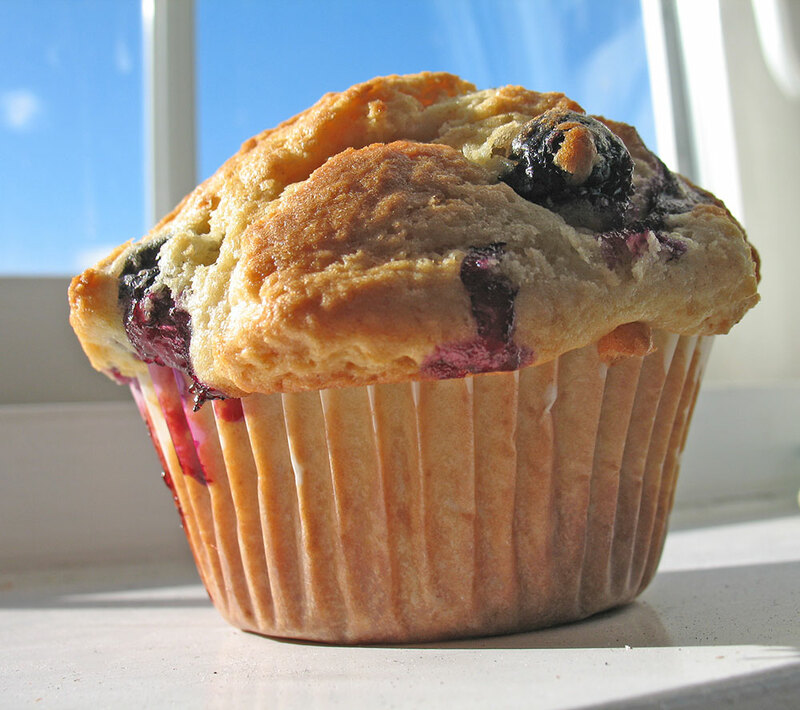 I used the basic muffin recipe I used for Spiced Cranberry Muffins , but replaced the cranberries with blueberries, and the spices with 2 tablespoons of lemon curd and the rind of 1 lemon. They were perfect, slightly crunchy on the top but light in the middle. ~ makes 6 larger muffins. Preheat the oven 220oC. Line a muffin tray with cases. Mix the flour, baking powder, soda, sugar and lemon zest together in a bowl. In another bowl mix the egg, oil, yoghurt, milk and lemon curd together. Pour the liquid mixture into the dry and mix with a whisk (it keeps you from over mixing the batter). Mix the blueberries in. Split the mixture between the muffin cases. Place them in the oven, the recipe I has said 15 minutes in the oven, but I left mine for closer to 25 minutes, because they were so big. I would check them after 15 minutes and if not ready leave them in – checking every 5 minutes or so!